We will be happy to assist you Monday-Friday, 9am-6pm, EST. For customer service inquiries please fill the Contact Us form. To report a technical issue with our website, please fill the Tech Support form. We want to hear what YOU have to say, submit your Feedback. Join our community on Facebook, Google+ and Twitter. Watch our media on YouTube and Instagram. 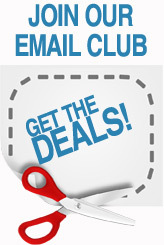 And get the newest News (or just the special promotions, as you wish) with our Newsletter Club.